Microsoft, not typically in the hardware business, made a major announcement in late June. It's called "Surface" and it's a 10.6" tablet computer set to tip the world of portable computing on its ear. Billed as a hybrid, Surface is a powerful tablet offering a couple of different configurations, a two keyboard options that will make this latest offering a true productivity tool. The entry level Surface offers 32GB and 64GB memory options, ARM chipset, and will run the Windows RT operating system. At a mere 9mm thick, and weighing just 1.5 pounds, this version is a truly powerful and desirable tablet. The second option will be powered by the Intel Ivy chipset, will run the Windows 8 Pro operating system, and will offer 64GB or a whopping 128GB of memory. This version also includes a USB 3.0 port for ultrafast connectivity to external devices, including storage and Blu-ray drives. It will also come standard with its own "pen" for writing and drawing on the ClearType HD touch screen. Both Surface varieties are impressive, and the configuration options will resonate with consumers looking for the biggest bang for their buck. It is the keyboard options, however, that will separate Surface from all other tablets, and will no doubt lead to the transformation of the entire class of computers. Virtual keyboards behind the touch screens have their place in the world of tablet computing. They represent the absence of an additional piece of hardware, and for most tablet users this is seen as a plus. Most tablet users, however, don't purchase their iPads or Galaxy tablets as a productivity tool. Surface will change all this with two different keyboard styles sure to please all comers. Both versions also serve as covers, which conveniently unfold with the keyboard flat and the Surface at the proper angle for viewing while typing. The first option is the "touch" keyboard. It's a full size keyboard with keys that are flush, and includes a touchpad for mouse and scroll control. The second option is the "type" keyboard, and comes complete with raised keys for a more authentic typing and input experience. The ARM version of Surface will be available in time for holiday shopping, with the Intel Ivy version due approximately three months later. 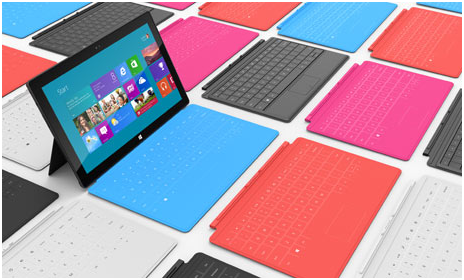 We're excited for Surface and for all it represents in the advancement of tablet computing. Will you try out one of the new Surface tablets? Justin is a sports, marketing and tech enthusiast. When not in the stands watching University of Utah football.